You wait ages for an exhibition about the tube, and then two come along at once. Why? Max Roberts is a man who knows more about how tube maps work than the officials whose job it is to produce them. He knows that a tube map is a fine balance between aesthetics and usability, and that if you add too much noise to a network diagram it gets very inefficient. What's more, he has a graphics package which allows him to generate a wide variety of alternative tube maps just to make a point. Can changing the angles the lines run at make a difference, and if so is 60 degrees better than 45? Do curves work better, or worse? What happens if you allow some geographical reality back in, or if you twirl the entire map so that east is at the top? Some of these new versions are clearly for fun only, but one or two could give TfL's latest a run for their money, if only bosses would ever dare to take on board a few of the lessons learned. Whatever? It's less an exhibition hall, more the foyer to an architectural practice. But there's room enough for nine of Max's finer maps, plus a rolling display of some of his others on a screen at the back. Think of this as a taster for his main exhibition, which I went to see in Southend earlier this year and which was more recently on display up in Colchester. 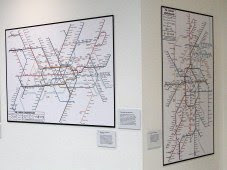 You probably didn't manage to go to either, because Essex is so very far away isn't it, so think of this as a magnificent opportunity to see London's iconic tube map reimagined in its hometown. If all goes well there might be a bigger show of Max's handiwork in the not-so-far future, but best not risk missing the current oportunity. For more information, and a fair few diagrammatic photos, check out Ian's report from the official launch on Thursday night. But trust me, the maps are much better pored over close-up. Whence? You've got two weeks to visit, alas not including weekends, but there's late opening on Thursdays.